Why Are Women Prisoners Battling California Wildfires for as Little as $1 a Day? | Democracy Now! Why Are Women Prisoners Battling California Wildfires for as Little as $1 a Day? member of the California Coalition for Women Prisoners, Los Angeles chapter. She is program coordinator for Project Rebound at Cal State University, Fullerton. "The Incarcerated Women Who Fight California’s Wildfires"
JUAN GONZÁLEZ: Well, we end today’s show in California, where raging wildfires have killed at least 41 people and scorched more than 200,000 acres—roughly the size of New York City. The fires are now the deadliest in California since record keeping began. At least 100,000 people have been forced to evacuate, with about 75,000 displaced after their homes and businesses were destroyed. 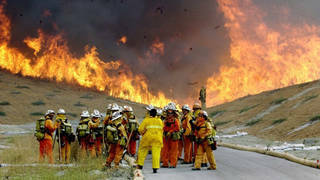 More than 11,000 firefighters are battling the blazes, and a number of them are prisoners, including many women inmates. In this clip from the film The Prison in Twelve Landscapes, an inmate with an all-woman crew describes being sent to fight a raging fire in Marin County. INMATE FIREFIGHTER: My first day here, when I first got to camp, I got thrown on a fire. We had just got through orientation, and the horn went off. And I got thrown on the bus, and off we went, chasing the smoke. We’re driving up the mountain and seeing dirty burn everywhere. All of a sudden, there’s a 40-foot wall of flame on both sides of me. AMY GOODMAN: That’s a clip from PBS’s Independent Lens, The Prison in Twelve Landscapes. To find out more about these firefighters, we’re joined by two guests. In Fullerton, California, Romarilyn Ralston is with us, of California Coalition for Women Prisoners, the L.A. chapter, program coordinator for Project Rebound at Cal State University. Romarilyn experienced 23 years of incarceration. While she was incarcerated, she was a fire camp trainer and a clerk for the California Department of Forestry and Fire Protection. Romarilyn, if you could start off by telling us who is on the front lines? People might be surprised to hear that prisoners, among them women prisoners, are fighting California’s wildfires right now. ROMARILYN RALSTON: Good morning, Amy and Juan. Thank you for having me on the show. Yes, the women who are on the front line are women who volunteer for the camp training program, or they’re assigned to the program because they have nonviolent offenses or are classified as minimum custody. So these are women who are able to leave the prison and be housed in one of the 43 conservation camps—I’m sorry, one of the three female conservation camps. AMY GOODMAN: And how is it that this program started? Who are these incarcerated women who are fighting fires? ROMARILYN RALSTON: Well, the program started many years ago, I think around World War II, where inmates became involved with fighting disasters within California, repairing roads and sandbagging floods and earthquakes, things like that. The first conservation camp for women was opened, I believe, in 1983, which is Camp Rainbow, which was formerly a male conservation camp. So, the firefighting program for female inmates has been around since 1983. JUAN GONZÁLEZ: And how much are they paid, compared to others who are fighting the fires on the front lines? ROMARILYN RALSTON: Well, fire pay is typically about a dollar an hour. While you’re in fire camp training, some folks are paid zero for that training or up to $18 a month. And then, once you get to the classroom and you are part of the field training, then that pay escalates to a whopping $48 a month. If you’re a swamper, you may get paid $56 a month. AMY GOODMAN: Why do women do it? AMY GOODMAN: Are you saying that they get to see their children if they fight the fire? ROMARILYN RALSTON: They get to see their children a lot sooner, because you get a reduced sentence. You earn a different credit. You earn day for day. You get to see your children in a visiting area at a camp, not in a prison, where there are less restrictions, where the environment is more park-like. Who doesn’t want that? JUAN GONZÁLEZ: And, Jaime Lowe, you wrote the article “The Incarcerated Women Who Fight California’s Wildfires.” Could you talk about some of the people you interviewed and what you found? JAIME LOWE: Sure. I talked to people who ranged in like many different sociological backgrounds. I found that their response to the program was anything from, you know, resenting the depth and the hardship of the work, because it’s intense physical labor, to a lot of appreciation for the responsibility of working within the community and doing something that was giving back to it. That said, I think that it was—you know, these women are putting their lives on the line for very little money. They make a dollar an hour when they’re actually fighting fires, two dollars a day in camp per day. And while the camps are a nicer place to experience prison, they’re still prison. They’re still prisoners. AMY GOODMAN: What surprised you most in your research, Jaime, for this piece for The New York Times? AMY GOODMAN: Have any of the women, have any of the prisoners, who are fighting the fires, lost their lives? JAIME LOWE: Yes. So, that’s how I was first sort of—not introduced, but that’s why I wanted to write about the program. I had never fully heard of it, and I read a small article about Shawna Lynn Jones, who passed away in February of 2016. And she was on one of the crews in the Malibu camp. There are three female camps. And it struck me that nobody really talked about who she was, how she got there, her background and how she ended up dead. AMY GOODMAN: Well, we’re going to continue this discussion, have you back on later in the week. This is a critical story, Jaime Lowe of The New York Times. We’ll link to “The Incarcerated Women Who Fight California’s Wildfires,” has a new book out this week called Mental, and we’ll interview you about that. Juan, you’re going to be speaking at Rutgers tonight? JUAN GONZÁLEZ: Yes, at the Barnes & Noble bookstore in New Brunswick. AMY GOODMAN: Check it out at democracynow.org. And, Romarilyn Ralston, thank you so much.